“We reject the university evaluation of the press.” On September 26, 2014, General Student Association(GSA) members of Hanyang University(HYU), Dongguk University, Sungkonghoe University, and Kyunghee University gathered in front of the building of JoongAng Daily. On their hands were pickets which questioned thenecessity of the press’s ongoing program, JoongAng Daily University Evaluation. Considering the past reactions of such universities which simply showed the desire to receive higher ranks, the actions of the GSA were unprecedented. 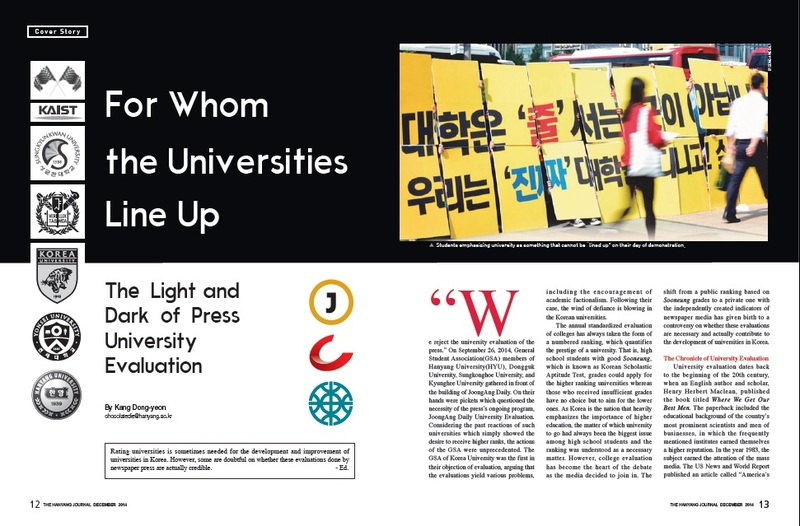 The GSA of Korea University was the first in their objection of evaluation, arguing that the evaluations yield various problems, including the encouragement of academic factionalism. Following their case, the wind of defiance is blowing in the Korean universities. The annual standardized evaluation of colleges has always taken the form of a numbered ranking, which quantifies the prestige of a university. That is, high school students with good Sooneung, which is known as Korean Scholastic Aptitude Test, grades could apply for the higher ranking universities whereas those who received insufficient grades have no choice but to aim for the lower ones. As Korea is the nation that heavily emphasizes the importance of higher education, the matter of which university to go had always been the biggest issue among high school students and the ranking was understood as a necessary matter. However, college evaluation has become the heart of the debate as the media decided to join in. 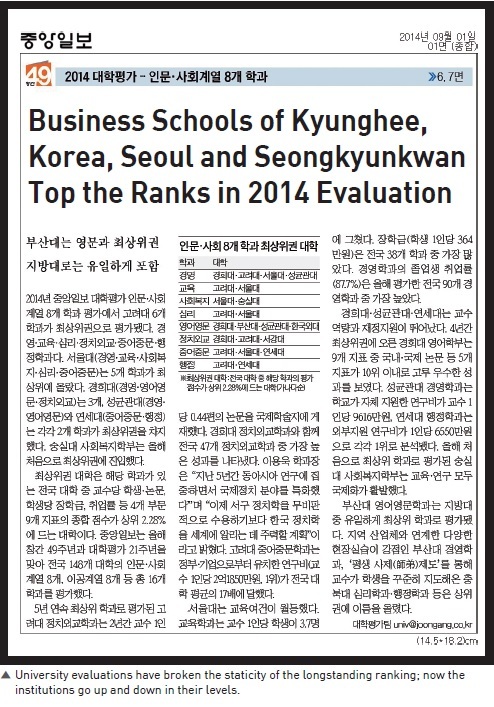 The shift from a public ranking based on Sooneung grades to a private one with the independently created indicators of newspaper media has given birth to a controversy on whether these evaluations are necessary and actually contribute to the development of universities in Korea. University evaluation dates back to the beginning of the 20th century, when an English author and scholar, Henry Herbert Maclean, published the book titled Where We Get Our Best Men. The paperback included the educational background of the country’s most prominent scientists and men of businesses, in which the frequently mentioned institutes earned themselves a higher reputation. In the year 1983, the subject earned the attention of the mass media. The US News and World Report published an article called “America’s Best Colleges,” which was the first time information regarding higher educational institute was revealed to the public. This year was the turning point in that numerous presses from all around the world made a similar attempt, such as “Times Good University Guide” in Great Britain. The motive behind lining up the colleges was to narrow the gap between the public and the higher educational institutes. “As the ideology of neoliberalism struck America at the beginning of 19th century, universities changed from elitist, governmental communities to private institutions with more accessibility to anyone who wished to study. Now that universities became more open to the public, it became all the more necessary to make their management transparent,” said Choi Jong-woon, the former President of the GSA of KU who has been actively investigating on the matter. The first Korean press to follow the international trend was JoongAng Daily, which started evaluating universities from the year 1994. 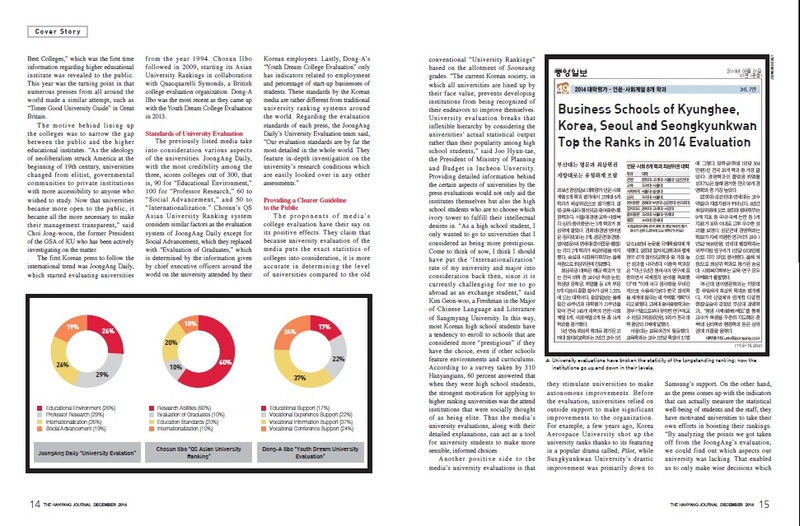 Chosun Ilbo followed in 2009, starting its Asian University Rankings in collaboration with Quacquarelli Symonds, a British college evaluation organization. 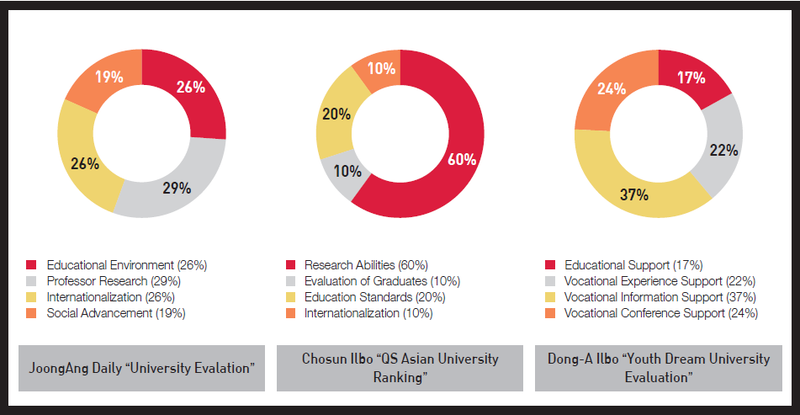 Dong-A Ilbo was the most recent as they came up with the Youth Dream College Evaluation in 2013. 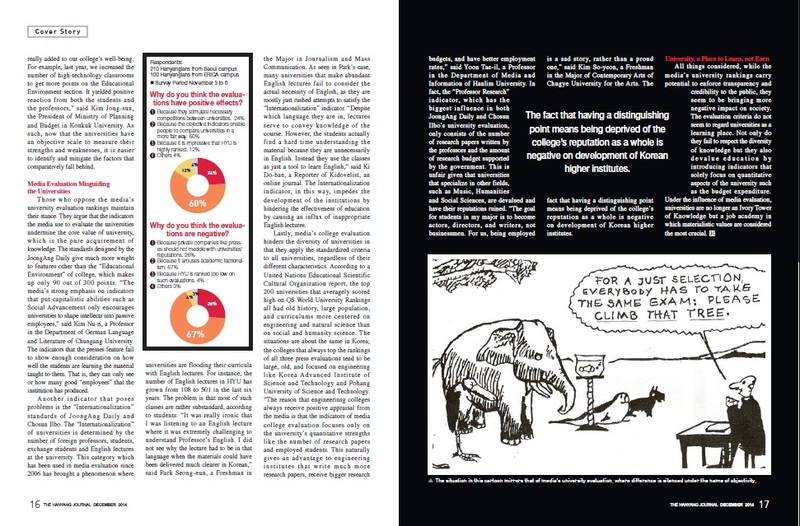 The proponents of media’s college evaluation have their say on its positive effects. They claim that because university evaluation of the media puts the exact statistics of colleges into consideration, it is more accurate in determining the level of universities compared to the old conventional “University Rankings” based on the allotment of Sooneung grades. “The current Korean society, in which all universities are lined up by their face value, prevents developing institutions from being recognized of their endeavors to improve themselves. University evaluation breaks that inflexible hierarchy by considering the universities’ actual statistical output rather than their popularity among high school students,” said Joo Hyun-tae, the President of Ministry of Planning and Budget in Incheon Unversity. Providing detailed information behind the certain aspects of universities by the press evaluations would not only aid the institutes themselves but also the high school students who are to choose which ivory tower to fulfill their intellectual desires in. “As a high school student, I only wanted to go to universities that I considered as being more prestigious. Come to think of now, I think I should have put the ʻInternationalizationʼ rate of my university and major into consideration back then, since it is currently challenging for me to go abroad as an exchange student,” said Kim Geon-woo, a Freshman in the Major of Chinese Language and Literature of Sangmyung University. In this way, most Korean high school students have a tendency to enroll to schools that are considered more “prestigious” if they have the choice, even if other schools feature environments and curriculums. According to a survey taken by 310 Hanyangians, 60 percent answered that when they were high school students, the strongest motivation for applying to higher ranking universities was the attend institutions that were socially thought of as being elite. Thus the media’s university evaluations, along with their detailed explanations, can act as a tool for university students to make more sensible, informed choices. Another positive side to the media’s university evaluations is that they stimulate universities to make autonomous improvements. Before the evaluation, universities relied on outside support to make significant improvements to the organization. For example, a few years ago, Korea Aerospace University shot up the university ranks thanks to its featuring in a popular drama called, Pilot, while Sungkyunkwan University’s drastic improvement was primarily down to Samsung’s support. On the other hand, as the press comes up with the indicators that can actually measure the statistical well-being of students and the staff, they have motivated universities to take their own efforts in boosting their rankings. “By analyzing the points we got taken off from the JoongAng’s evaluation, we could find out which aspects our university was lacking. That enabled us to only make wise decisions whichreally added to our college’s well-being. For example, last year, we increased the number of high-technology classrooms to get more points on the Educational Environment section. It yielded positive reaction from both the students and the professors,” said Kim Jong-sun, the President of Ministry of Planning and Budget in Konkuk University. As such, now that the universities have an objective scale to measure their strengths and weaknesses, it is easier to identify and mitigate the factors that comparatively fall behind. Those who oppose the media’s university evaluation rankings maintain their stance. They argue that the indicators the media use to evaluate the universities undermine the core value of university, which is the pure acquirement of knowledge. The standards designed by the JoongAng Daily give much more weight to features other than the “Educational Environment” of college, which makes up only 90 out of 300 points. “The media’s strong emphasis on indicators that put capitalistic abilities such as Social Advancement only encourages universities to shape intellects into passive employees,” said Kim Nu-ri, a Professor in the Department of German Language and Literature of Chungang University. The indicators that the presses feature fail to show enough consideration on how well the students are learning the material taught to them. That is, they can only see or how many good “employeesˮ that the institution has produced. has been used in media evaluation since 2006 has brought a phenomenon where universities are flooding their curricula with English lectures. For instance, the number of English lectures in HYU has grown from 108 to 501 in the last six years. The problem is that most of such classes are rather substandard, according to students. “It was really ironic that I was listening to an English lecture where it was extremely challenging to understand Professor’s English. I did not see why the lecture had to be in that language when the materials could have been delivered much clearer in Korean,” said Park Seong-eun, a Freshman in the Major in Journalism and Mass Communication. As seen in Park’s case, many universities that make abundant English lectures fail to consider the actual necessity of English, as they are mostly just rushed attempts to satisfy the “Internationalization” indicator. “Despite which language they are in, lectures serve to convey knowledge of the course. However, the students actually find a hard time understanding the material because they are unnecessarily in English. Instead they use the classes as just a tool to learn English,” said Ki Do-bae, a Reporter of Kidovelist, an online journal. The Internationalization indicator, in this way, impedes the development of the institutions by hindering the effectiveness of education by causing an influx of inappropriate English lectures. Lastly, media’s college evaluation hinders the diversity of universities in that they apply the standardized criteria to all universities, regardless of their different characteristics. According to a United Nations Educational Scientific Cultural Organization report, the top 200 universities that averagely scored high on QS World University Rankings all had old history, large population, and curriculums more centered on engineering and natural science than on social and humanity science. The situations are about the same in Korea; the colleges that always top the rankings of all three press evaluations tend to be large, old, and focused on engineering like Korea Advanced Institute of Science and Technology and Pohang University of Science and Technology. “The reason that engineering colleges always receive positive appraisal from the media is that the indicators of media college evaluation focuses only on the university’s quantitative strengths like the number of research papers and employed students. This naturally gives an advantage to engineering institutes that write much more research papers, receive bigger research budgets, and have better employment rates,” said Yoon Tae-il, a Professor in the Department of Media and Information of Hanlim University. In fact, the “Professor Research” indicator, which has the biggest influence in both JoongAng Daily and Chosun Ilbo’s university evaluation, only consists of the number of research papers written by the professors and the amount of research budget supported by the government. This is unfair given that universities that specialize in other fields, such as Music, Humanities and Social Sciences, are devalued and have their reputations ruined. “The goal for students in my major is to become actors, directors, and writers, not businessmen. For us, being employed is a sad story, rather than a proud one,” said Kim So-yeon, a Freshman in the Major of Contemporary Arts of Chugye University for the Arts. The fact that having a distinguishing point means being deprived of the college’s reputation as a whole is negative on development of Korean higher institutes. All things considered, while the media’s university rankings carry potential to enforce transparency and credibility to the public, they seem to be bringing more negative impact on society. The evaluation criteria do not seem to regard universities as a learning place. Not only do they fail to respect the diversity of knowledge but they also devalue education by introducing indicators that solely focus on quantitative aspects of the university such as the budget expenditure. Under the influence of media evaluation, universities are no longer an Ivory Tower of Knowledge but a job academy in which materialistic values are considered the most crucial.